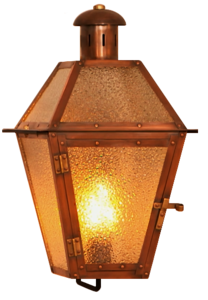 The Weiyan LED Electric Lighting System for The Coppersmith Electric Lights. The Weiyan upgrade uses a LED light that flickers to resemble a open flame burner. NOTE: The Weiyan light kit is an option that must be ordered with any Coppersmith brand electric light. Your light will arrive with special seeded glass as shown and the Weiyan fixture and bulb already installed. This option is not offered separately or for any other manufacturer's lights.